If you’re just joining us in this world of Evy’s Tree, or if you’ve been our friend for awhile now, you will know one of our deepest desires is to empower, encourage, and inspire women everywhere. We love strong women; may we raise them, know them, and be them! When Amy first began designing hoodies, the quirky and beautiful Lizzy Zip Up was one of her first designs and she named it after one of her favorite literary heroines; the indomitable, intelligent, strong, and witty Elizabeth (Bennett) Darcy, a gift to women everywhere, courtesy of Jane Austen. The Lizzy first appeared in orange, teal, and pistachio choices before undergoing a slight revamp in design that included a texturally delightful quilted detail added to the collar and sleeves and came in either persimmon or pomegranate. Additional follow-up designs featured a lovely pine needle green, a fun summery neapolitan stripe color scheme, and then a rich boysenberry color with matching Honey by Evy’s Tree sizes for the little lady! And now, we are excited to bring you another gorgeous Lizzy, this one in a perfect black. The Lizzy Zip Up is a quirky and unique design centered around an asymmetrical zipper, with coordinating ribbed sleeve cuffs/waist band, thumbholes and fully functional pockets. 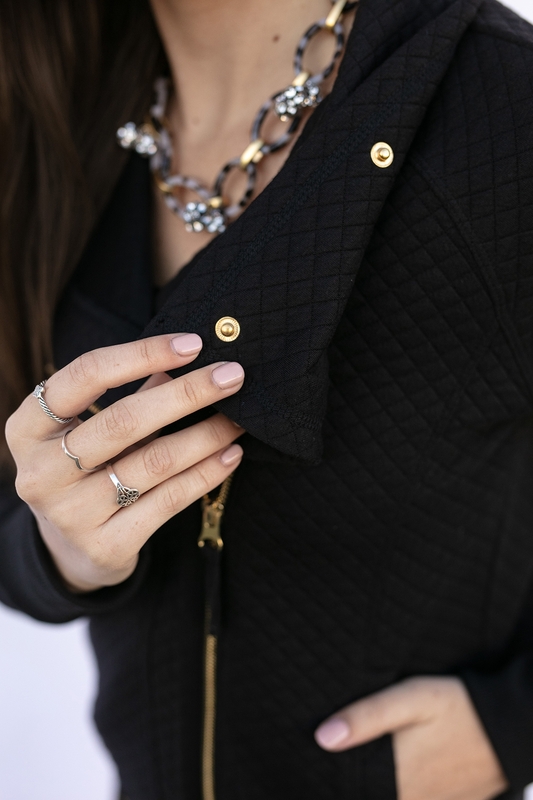 The cozy quilted knit fabric is a super soft and blissfully buttery luxe material that you won’t want to take off! And in a new take on our original style, we’ve added snaps to the large collar that will allow you to close it up securely around your neck if the day is particularly cold. This gorgeous and classic Evy’s Tree piece will add some depth and warmth to your wardrobe, and the solid color is a foundational basic for many of your closet items. You will be able to add this to nearly any of your ensembles, and trust us when we say this one will go fast; don’t miss out! The Lizzy is very true to size; sizing up or down is not recommended. Model for Lizzy Zip Up in Black is @vanessawilkinson.Professional photography by http://www.dasophoto.com/ (@DASOphoto on Instagram). Hair/makeup is by Katie http://www.whimsybridal.com/.